The annual Ulster GAA Cúchulainn Cup took place at the Meadowbank Sports Arena, Magherafelt on Wednesday 10th April. The Cúchulainn Initiative aims to afford young people from different backgrounds the opportunity to engage with one another, and to educate people not traditionally involved with the GAA more about the Association. Taking part in the boys’ competition for the first time were Lisburn, with Antrim, Enniskillen and the 2018 winners Ballymoney returning once again. In the girls’ competition 2018 winners Belfast participated alongside Banbridge, Foyle and following in the footsteps of their male counterparts, Ballymoney entered a girls team for the first time. In preparation for the Cúchulainn Cup Blitz, schools were given “GAA Taster Sessions” in which pupils who had never played Gaelic games, or had very little interaction in the Games were taught the basic skills of Gaelic Football and Hurling. Taster Sessions were provided in 15 schools with over 500 Year 11 boys and girls getting an opportunity to sample what the GAA has to offer. 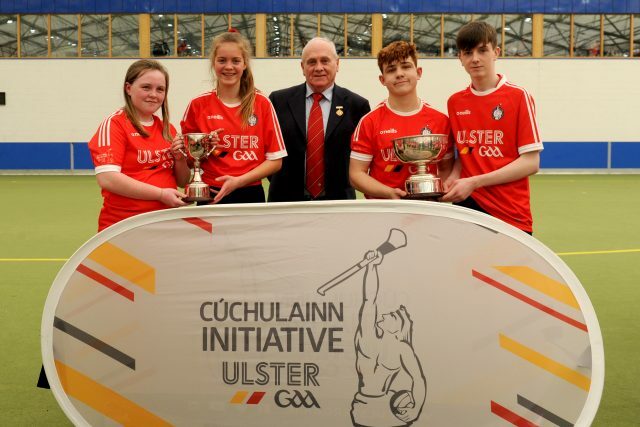 In addition, “Getting to Know the GAA” presentations were delivered to participating schools which helped to promote greater understanding and respect for other cultures; a key aim of the Cúchulainn Initiative. After a very enjoyable day of games there was double delight for the town of Ballymoney with success in both the boys and girls competitions.